Have a question about Ninja training, preparedness, ages, and more? Check out our FAQs below. Do I need to be a member to train on your Ninja Obstacle Course? Membership is not required. Drop-in attendance is $20 a class for kids, teens, and adults; Mini Ninjas (ages 3 to 5) are $15 a class. Membership is also available. For more information about our membership packages, call (916) 258-KICK (5425) or stop by our front desk. What are the age groups for Ninja training? Can I just show up for class? All first-time visitors must make a reservation; please call us at (916) 258-5425. After attending your first class, you don’t need a reservation for future classes. Is your class structured or open gym? We only offer structured classes for kids, supervised by our Ninja coaches. Adults classes are structured as well. However, we also offer open gym to adults with a membership who have attended Ninja classes or safety orientation. Open gym is by appointment only, based on availability of the room. Are you an Ultimate Ninja Athlete Association (UNAA) gym? Yes, we’re an official UNAA gym. We also host UNAA qualifier tournaments. Our Ninja Obstacle Course provides a full-body workout! You’ll have a chance to exercise every area, from your lower body (such as on our ground obstacle course) to your upper body (for example, on the monkey bars). Bring a towel and water bottle (we also have a drinking fountain). On weekdays, Mini Ninja and Kid Ninja classes are 45 minutes. On Saturday, child classes are 1 hour. Teen/adult Saturday classes are 45 minutes, with an optional 15-minute open floor session at the end. Are there different Ninja levels in class? There is a single level for Mini Ninjas. There are 6 levels for Kid Ninjas. On the last Saturday of each month, a level-up test opportunity is offered to participants. Testing requirements for each level are described on our level-up sheets. There are two separate classes for Teen/Adult Ninjas, based on level. Novice and intermediate students attend one class, while advanced students attend a different class. Can my 5-year-old attend Kid Ninja classes instead of Mini Ninjas? After an assessment of your child’s abilities by one of our Ninja coaches, with special permission he or she may be allowed to participate in classes for ages 6 to 12. Please call ahead to discuss this with one of our team members. Can I bring my child’s friend to class with us? Do I need previous experience to attend a class? No previous experience is necessary, you’ll just need to attend the appropriate class based on your level. 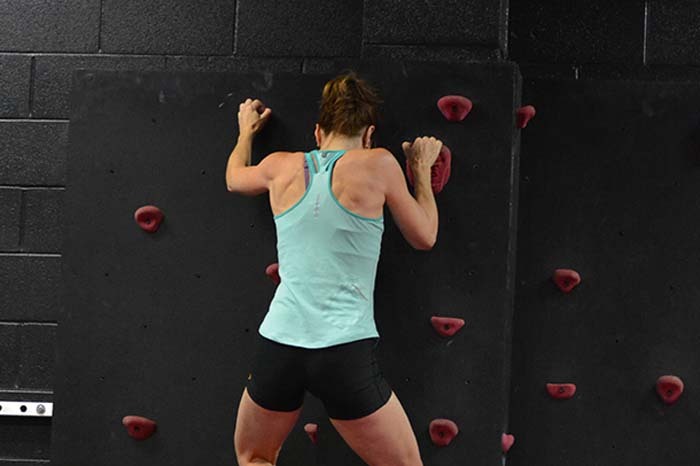 Every class has a different focus, with our Ninja coaches highlighting specific obstacles during the class. Ninja class participants of all levels should wear comfortable workout clothes that are not baggy or loose, to prevent clothing getting caught in obstacles. Shoes are not required. Do you offer Ninja shirts? We do! Ninjas of all ages can purchase our black Ninja shirts. Colored shirts are also available for Kid Ninjas (ages 6 to 12), but these can only be purchased after participating in class and passing the level-up test associated with each shirt color. What kind of obstacles do you have, and do they ever change? Who can try the salmon ladder? Kids are not typically allowed on the salmon ladder. Adults must be able to do at least 10 pull-ups before qualifying to attempt the salmon ladder, unless the Ninja coach makes an exception. Our schedule varies seasonally. Please click here to download our current schedule. Are Ninja tournaments offered that I can participate in? Yes, we host tournaments on a regular basis, including Ultimate Ninja Athlete Association (UNAA) qualifier tournaments. I’m really out of shape — can I handle Ninja training? This is an intensive workout requiring strength and stamina, so it is designed for those who are in great condition. If you’d like to try our Ninja Obstacle Course but need to get in shape first, we invite you to join us for fitness classes (or private sessions with one of our personal trainers), working toward the goal of Ninja training. Please contact us for more details about our fitness classes. We have two bathrooms/changing rooms and one private shower. Do you offer Ninja birthday parties and work functions? We do! In Style Magazine’s 2018 Readers’ Choice Awards, we were voted #2 best birthday party spot, and our Ninja Obstacle Course was voted best kids’ activity. In the Roseville Press Tribune’s 2018 Best of the Best Awards, our Ninja Obstacle Course was voted best kids’ recreation. To learn more about our birthday parties, please click here. For organizational Ninja functions, we offer group training, team building, leadership development, and much more. Functions are custom-tailored to your organization’s specific goals and needs. Please contact us for more details. Do you offer Ninja camps for kids? Yes! Every June and July we offer a week-long Martial Arts & Ninja Obstacle Course camp for kids aged 4 through teens. Age-appropriate activities include fight scene choreography, Ninja obstacles, weapons training, martial arts, board breaking, arts and crafts, water balloons, games, and more. Contact us for more details. Give us a call at (916) 258-5425 or email info@trainatthestudio.com and we’d be happy to answer any other questions.